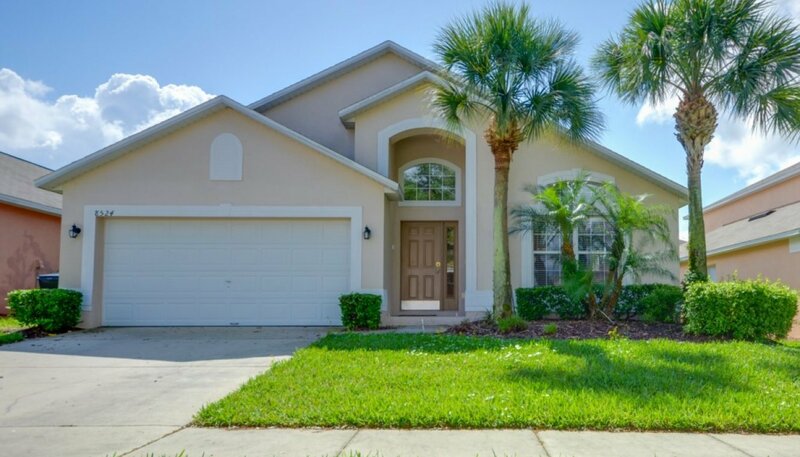 This attractively decorated luxury home offers 4 bedrooms, 2 bathrooms, living room, dining area, family room, kitchen, breakfast nook and games room. 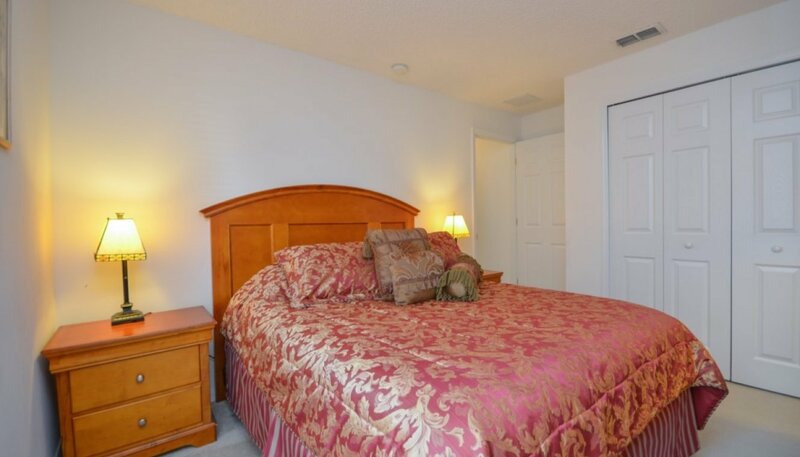 All bedrooms have LCD TV's and there is high speed WiFi throughout. 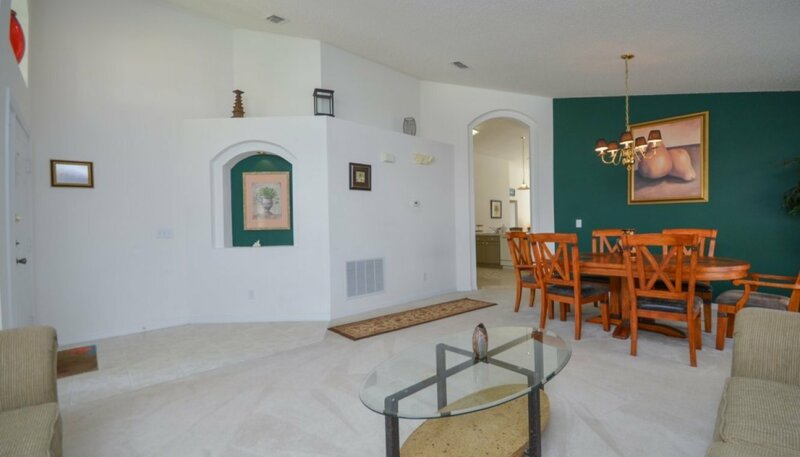 As you enter the villa you are greated with a fabulous tiled hallway with the living room to your immediate right and dining area behind that. 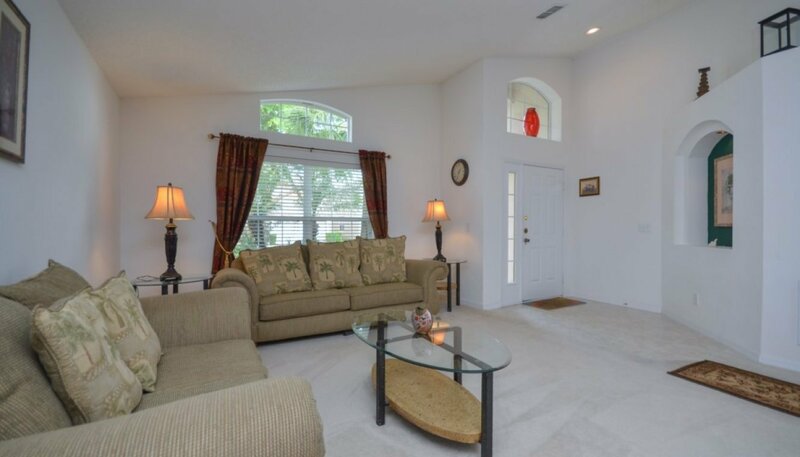 The hallway then leads through arched opening onto the spacious open plan kitchen & family room beyond. The living room with 2 sofas and a coffee table and views onto front gardens. 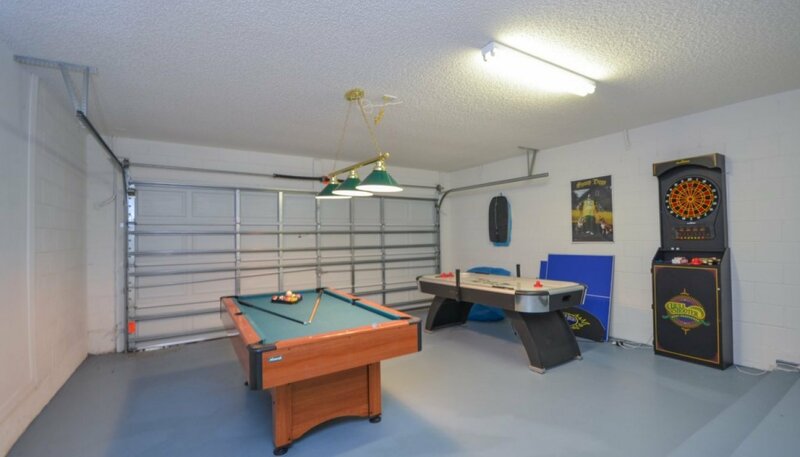 This is the ideal room for adults to unwind away from the heat of the day or the kids being noisy in the pool. Adjacent to the living room is the dining area with dining table with 6 chairs and is ideal for parties and formal dining. 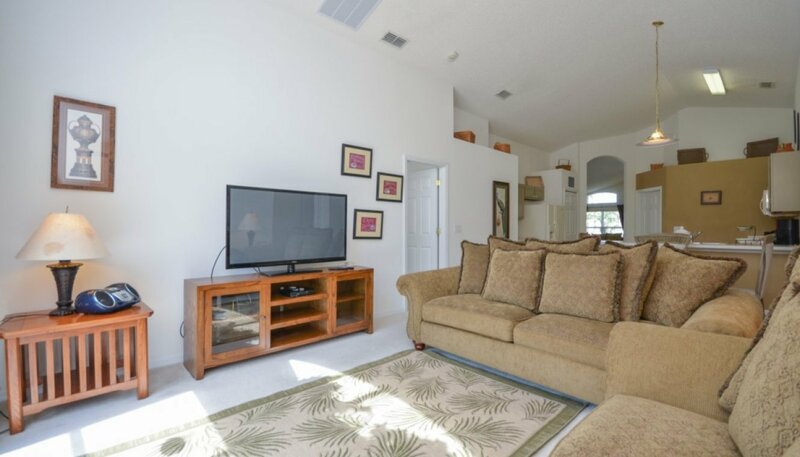 The family room has twin sofas, a large LCD TV with DVD player & CD stereo - a great place to view our movie collection or watch the "big game". Alternatively relax with a good book from our collection of books, play a board game, or listen to music. 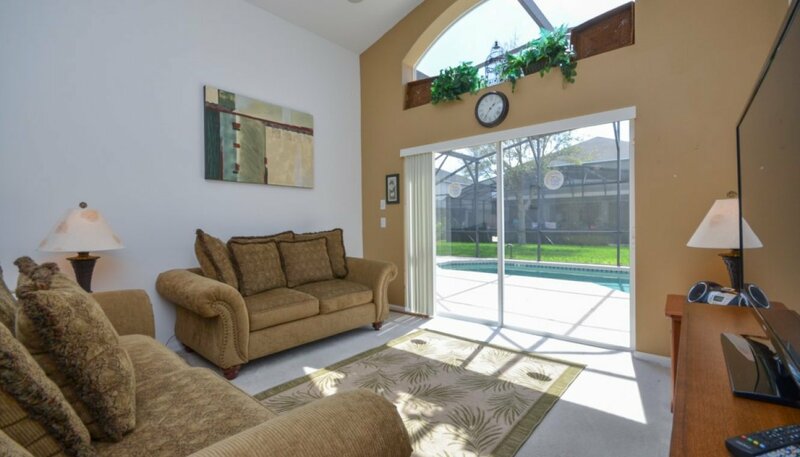 The family room overlooks the pool and deck area and enjoy watching the kids playing in the pool. 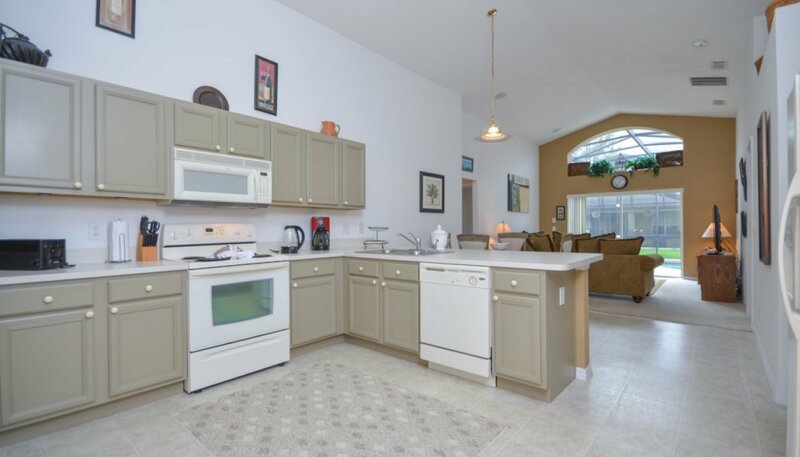 The fully equipped kitchen is situated in the centre of the home next to the breakfast nook which has a 4 seat table and chairs. 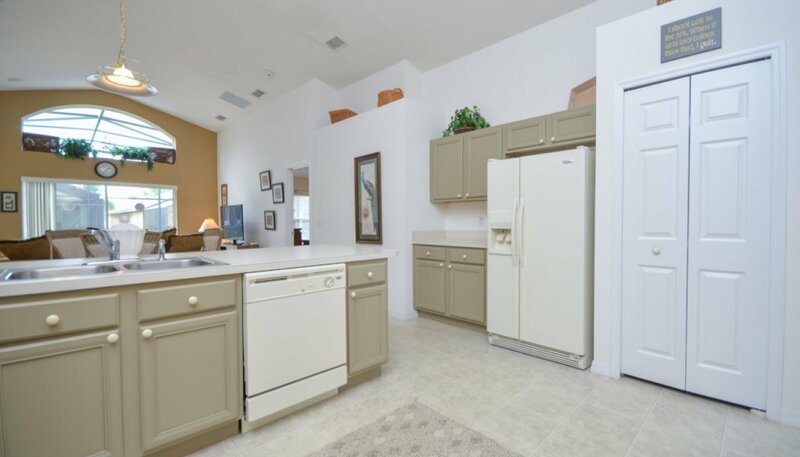 The kitchen has everything you are likely to require if you wish to cook indoors with a large oven, microwave, fridge freezer with ice maker, coffee maker and kettle. Even a juicer for those lovely Florida oranges. 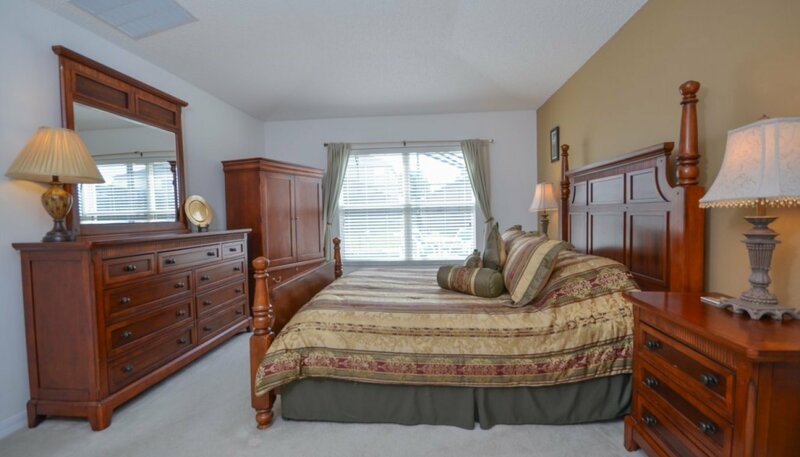 The first master bedroom has a king sized bed, twin night stands with individual table lights, radio alarm clock and storage cabinet housing a large LCD TV. The master ensuite bathroom has a walk in shower, a Roman bath and separate WC. There are ample towels and a hair dryer. Just through the bathroom there is a walk in wardrobe with ample hanging space and plenty of floor space to store your suitcases. 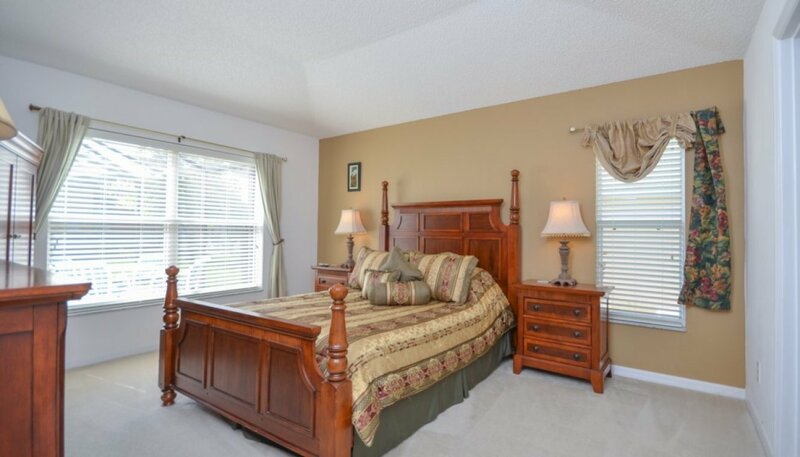 This bedroom is a quiet bedroom to the side of the property and has a queen sized bed, twin night stands, individual table lights and LCD TV and built-in cupboard with ample hanging space. 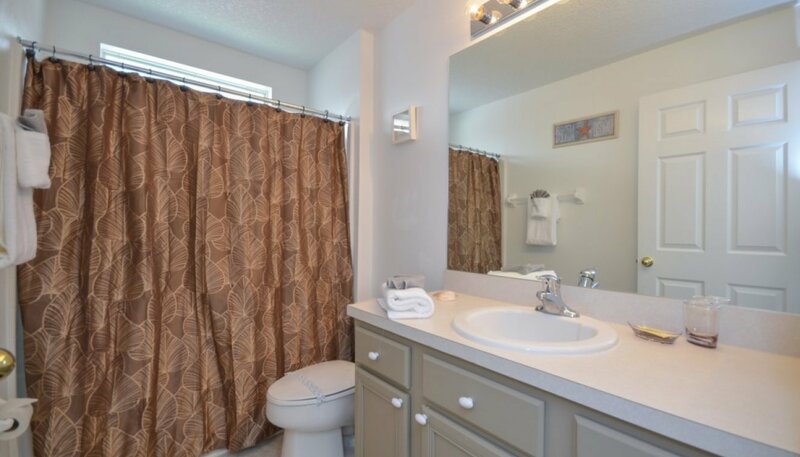 This bathroom is located between the two twin bedrooms and is equipped with with a bath and shower over, sink and WC. 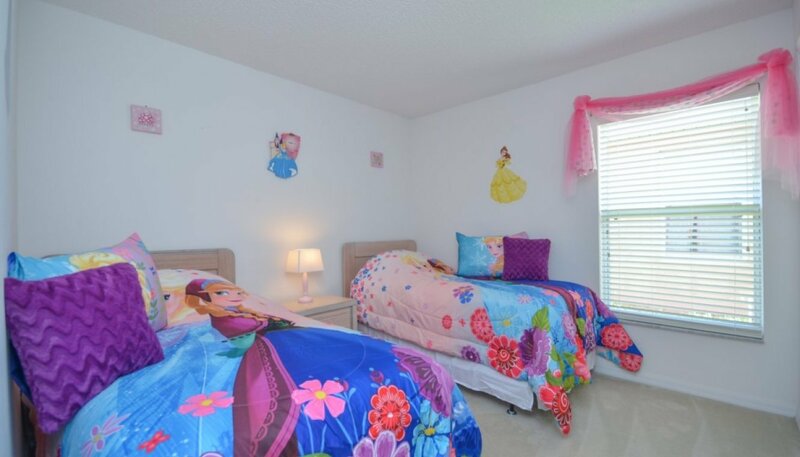 Younger children will love this Princess themed twin bedroom with twin beds, LCD TV and built-in wardrobe. 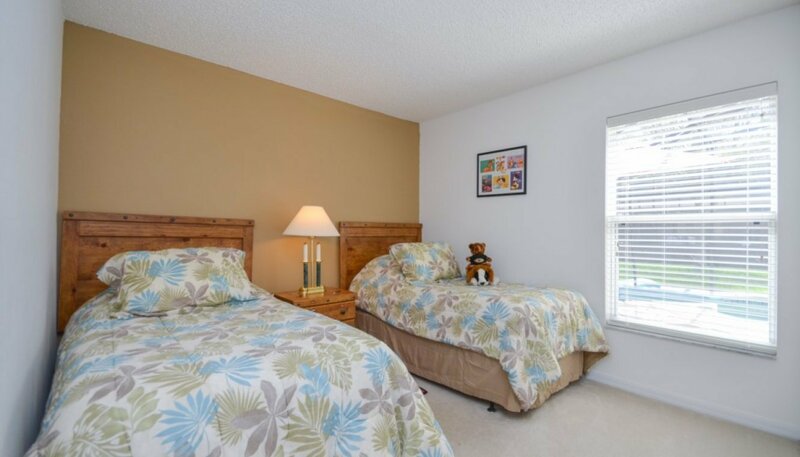 This twin bedroom has views onto the pool deck and come with an LCD TV and built-in wardrobe. 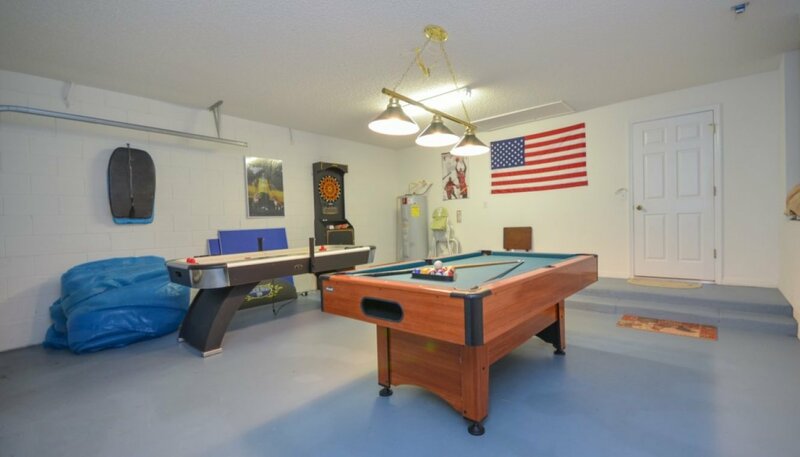 Accessed through the laundry room you will find a spacious games room with a pool table, air hockey and electronic darts board with plastic tipped darts. 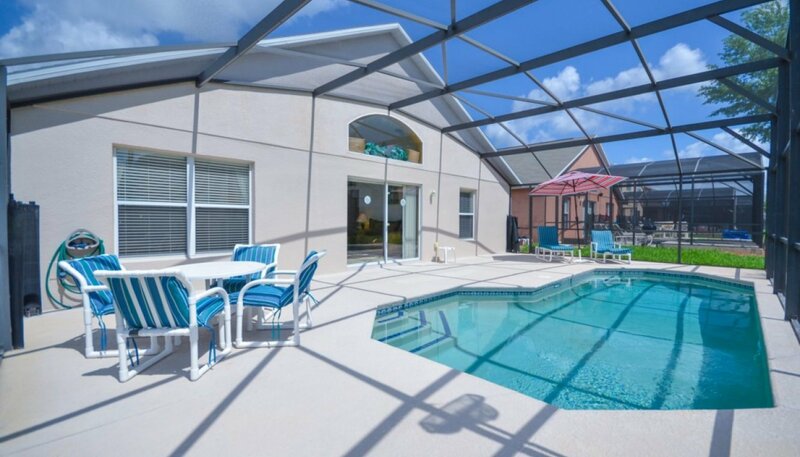 The south east facing pool gets the sun all day and comes with 2 sun-loungers, 4 chairs and a patio table with parasol. 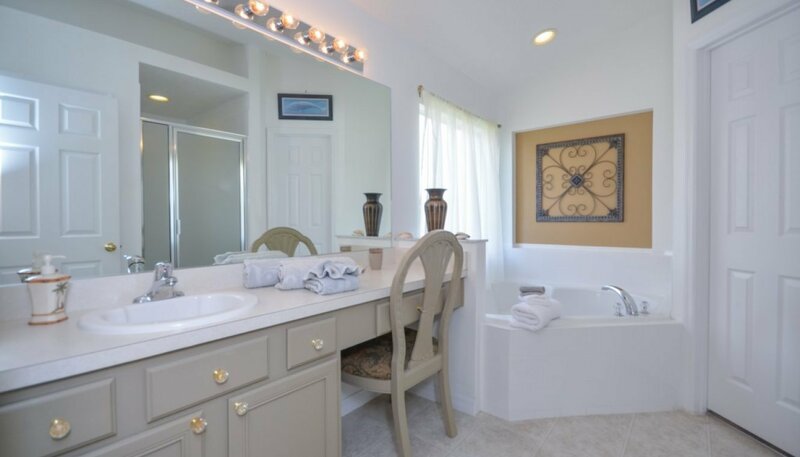 All towels and linens are provided although we do ask that no linens be removed from the house. If you plan on travelling to the beach on either coastline we provide beach towels or you purchase them locally for very little money. No need to get stressed on arrival - our villa has a key box, so if you are delayed at the airport, you can get into the villa anytime of the day or night - no need to travel miles out of your way in unfamiliar territory to collect keys - just pull up on the drive, tap in the code and your vacation can begin ! !